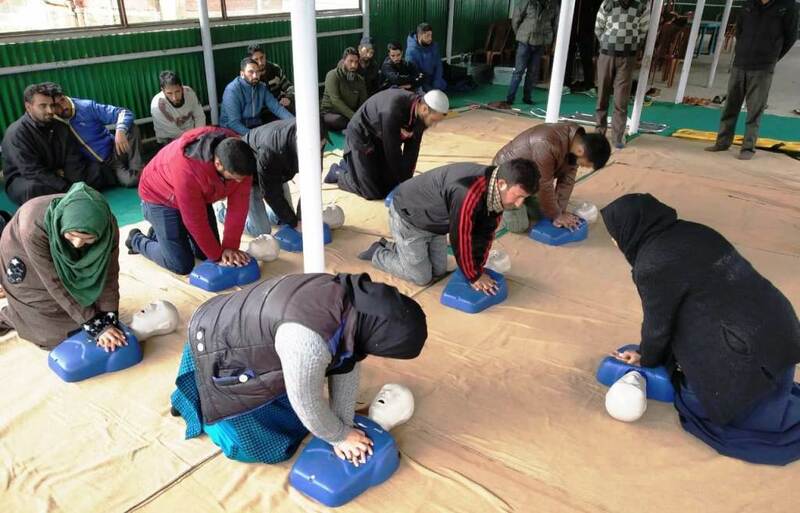 Directorate of Health Services, Kashmir (DHSK) in collaboration with Islamic University of Science & Technology (IUST), Awantipora on Thursday conducted one day Basic Life Support & Skills (BLSS) training programme. The spokesman said that participants included IUST Faculty, Students, Non-Teaching Staff, Drivers & Security Guards. More than 100 participants took part in the one-day long basic life support skills training programme. Trainees during Basic Life Support & Skills (BLSS) training programme. Rigorous simulation based mock drill was held wherein the trainees were made to simulate and priorities in handling basic trauma victims as a first responder. The training involved the basics of pre-hospital care being given by a first responder at the time of any eventuality. Various topics were included which ranged from managing bleeding conscious victim to Cardio Pulmonary Resuscitation (CPR) in an unconscious victim without breathing. The BLSS master trainers included Dr Arshad Rafi, Dr Ijtaba Shafi, Dr Sabeena Zargar, Shafi Shah, Ms Nighat Bashir along with volunteers. Director Health Services, Kashmir Kunzes Dolma said that trauma emergencies can strike anytime anywhere and in most cases medical assistance is not immediately available. We need to generate a bulk resource of first responders which shall help in providing a helping hand to the trauma victim in need during the times of emergencies and accidents till proper health services is availed. She also said that till date the department has imparted Basic Life Support Skills to more than 10000 persons since its inception at Kashmir Skills & Simulation Centre (KSSC), RIHFW, Dhobiwanwhile as more than 2000 persons have been trained under BLSS outreach programme wherein schools, colleges, airport, police department, university officials/students etc. have been imparted this training.